One of the standard indicators of a clutch basketball club is the experience they have. Teams that have seasoned veterans tend to perform best down the stretch, while young and inexperienced rosters struggle when it matters most. Last year, the Minnesota Timberwolves were filled with talent and had the league buzzing. Yet, they were also still the youngest team and therefore struggled to hold their leads late in games, ending the season as the lease clutch team in hoops. This 2017-18 Celtics roster is the sixth youngest in the NBA with an average age of 24.6. A year ago, that Timberwolves team's average age was only a little lower at 24. Despite their youth, however, Boston has been the complete opposite of last year's Timberwolves when the game is on the line - the Celtics have been the most clutch team in the league through 28 games. The NBA defines clutch as anytime a game is within five points with five minutes or less to play. Under this criteria, Brad Steven's unit currently leads the league in wins, points, three-pointers, assists, and plus/minus. They are also second in field goal percentage and steals. Kyrie Irving has taken the bulk of the crunch time responsibilities, and rightfully so. The point guard has possessed the clutch gene throughout his career, but the best example is when his late-game step-back three against the Warriors solidified the Cavaliers' first ever championship in the 2016 Finals. This season, Kyrie has been living up to the hype down the stretches of games. During clutch moments, his 77 points and 12 assists trail only LeBron James (81 points, 15 assists) for league-best. Not too many players are shooting it better in the clutch than Kyrie, who has shot 58% thus far. What may speak the most about his play is his zero turnovers in 53 minutes of time in close games. What is most surprising about Boston's clutch play hasn't been Kyrie, but rather their second option in crunch time: rookie Jayson Tatum. Although the 19-year-old has been incredibly efficient all year, his play late in games has been even more impressive. 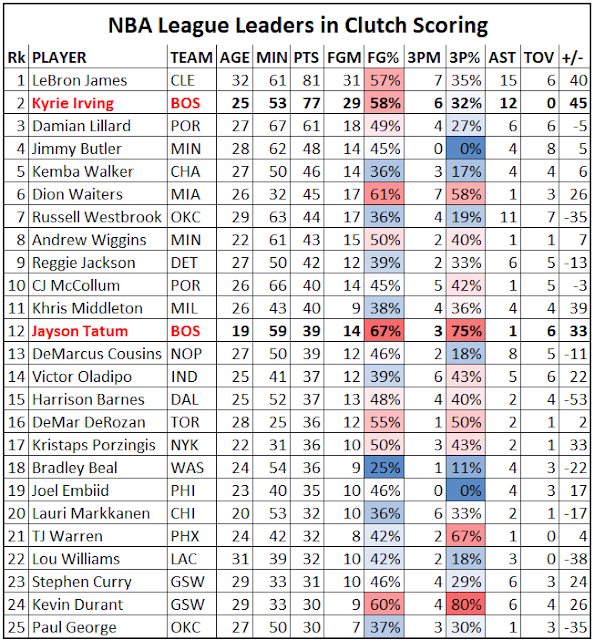 Tatum is 12th in the league in total clutch scoring with 39 points, but 25 players have taken more shots than him. This emphasizes that not only is he producing when it matters, but he's doing so at a high rate. His 66.7% field goal percentage and 75% three-point shooting in the clutch is straight bonkers. Of the leading clutch scorers, no one is shooting better than Jayson Tatum from the field, and Kevin Durant is the only player to top his three-point percentage. Not to mention he is also the youngest on this list. The average age of these clutch performers is 26 - seven years older than Tatum. That hasn't been stopping him from being one of the most clutch players in basketball this year! 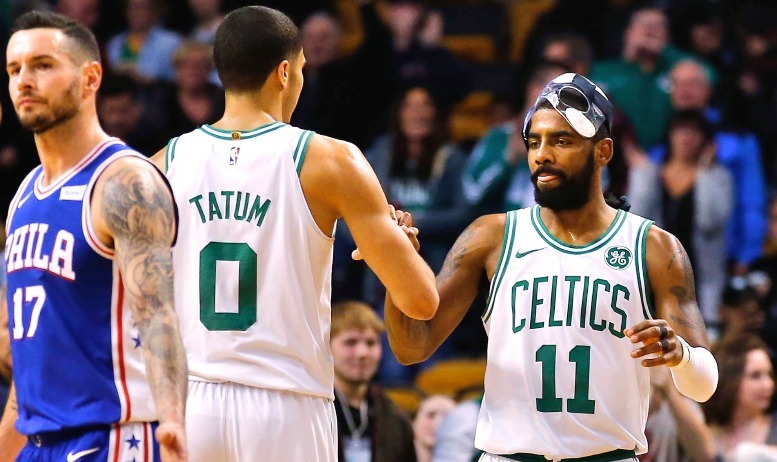 Led by Irving and Tatum, this young Celtics squad has been fantastic in closing out games. It would be nice to build and hold leads more often, but being the most clutch in the game certainly isn't a bad thing.